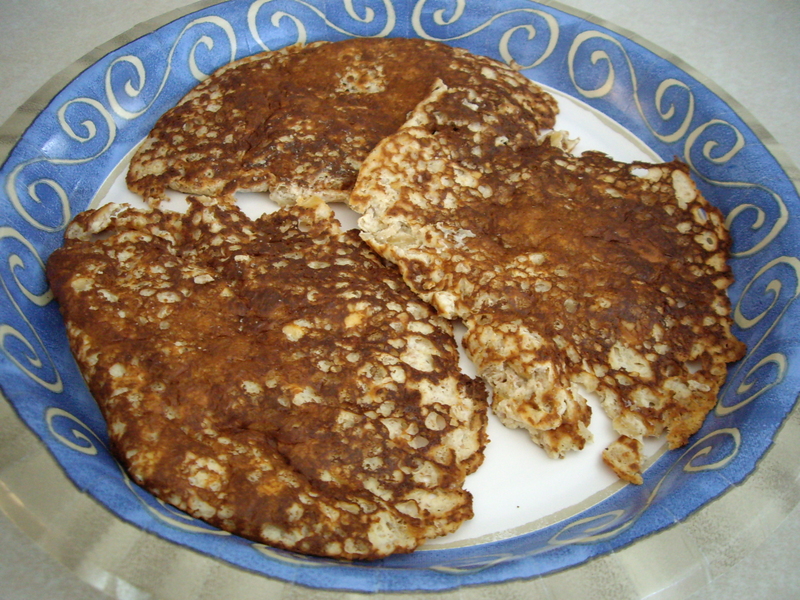 Oatmeal Pancakes | What's Cooking at the Genua's? Yes you read correctly. Oatmeal. And yes, I did eat oatmeal! And yes I did like it! BUT, it was in pancakes. Not as a cereal. (that will NEVER happen) But I still ate it! The pancakes were so good too! Last weekend my husband wanted pancakes. We never have a mix on hand because we make it once and then it sits there for months and months and by the time he wants them again the mix is no longer any good. So I found a recipe in the South Beach Diet Cookbook and changed it up a bit. 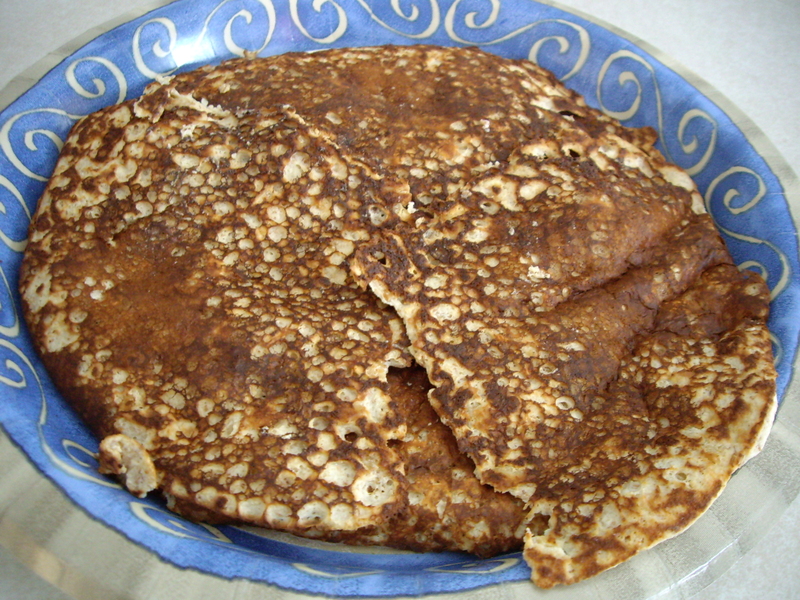 I used fat-free half-and-half in place of fat-free milk, soy flour in place of whole wheat flour and toasted wheat bran instead of toasted wheat germ. Came out awesome! The only problem was that I do not have a good flat griddle pan. I had to use my largest frying pan and needless to say the pancakes were a bit on the odd-looking side. They were not round. But they tasted really good! Nutty and a little more chewy than pancakes usually are but really tasty. I was going to add some cinnamon to the batter but I forgot. Next time! So please excuse the photos, don’t judge by their looks. We also used agave nectar instead of syrup and it was delicious. Didn’t have to use so much of it either! Oh and if you decide to make them you need prep time. About 40 minutes of “sitting” is needed. Read below and you’ll see what I mean. Not your usual round pancakes! There are actually 4 pancakes in this photo. 1. In a medium bowl, combine the oats and milk and let it stand for 10 minutes. 2. Stir in the egg, flour, wheat bran, baking powder, sugar substitute, oil and salt, mixing until evenly blended and only small lumps are left. Let the batter stand in the refrigerator for 30 minutes. 3. Heat a large nonstick skillet coated with cooking spray over medium heat. (Don’t do it on High like I did at first. Oops!). Working in batches, pour the batter by ¼ cup into the pan and cook for 3-4 minutes, or until the top starts to bubble and the bottom is browned. Turn and cook for another 1-2 minutes longer or until golden brown on bottom. 4. Remove to a plate and keep warm. Repeat to make a total of 12 pancakes.